Poor Richard’s Ale is an interpretation of Benjamin Franklin’s homebrew recipe. Poor Richard’s Ale is a semi dark, malty beer brewed with corn and Molasses. This beer most resembles Strong Scottish style ale. 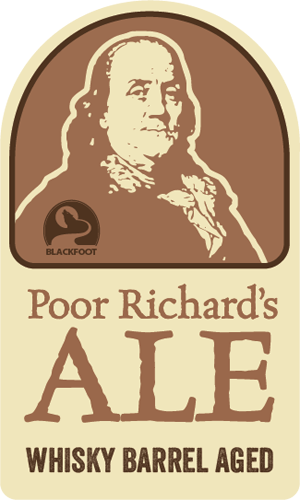 Blackfoot’s Poor Richard’s Ale is light brown in color with a malty aroma. The malty flavor is highlighted with notes of caramel, biscuit malt, toffee, and a creaminess that comes from corn. We aged Poor Richard’s in Whiskey barrels for two months to impart flavors of vanilla, oak, and whiskey.